We are tough cookies in Milford! Over 20 guests braved Friday afternoon’s harsh wintery weather to attend the Milford Community Care Group's annual new year party in All Saints’ church hall. Arriving to the wonderful ukulele music of The Strumpets, the afternoon got off to a lively start. The four female ukulele players were supported by “honorary strumpets” in the shape of two cheerful male guitar players. The musicians performed a very humorous song about love in later life --- but that is probably best not repeated in a family website! There was a splendid song specially written about Milford, and there were many opportunities for joining in the singing of old familiar songs. The session ended with “Bring me sunshine”. By this time, snow was gently falling again, so the song was more of a wish than an order! That was followed by the glamorous Nicole in her striking costume of vibrant red evening gown with white bolero, who treated the guests to beautiful singing, giving them songs from the shows, and some classical pieces. Tea was then served, with home-made sandwiches and cake, and guests were invited to take home with them the flower pieces on each table. The afternoon drew to a close with a lovely session of swinging music from the Windmill Quintet. 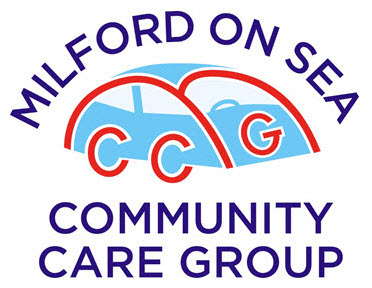 Guests were returned safely home, and will be looking forward to the Milford Community Care Group's summer outing in warmer weather! 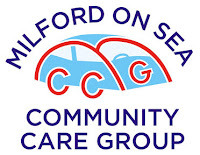 To help MCCG, simply phone 01590 641700 to offer your services as a driver or as an office helper. You will be very warmly welcomed! Looking for someone to walk your dog? Lobster Night is back at La Perle!